Come in and meet our staff today! William H. Truax III D.M.D. 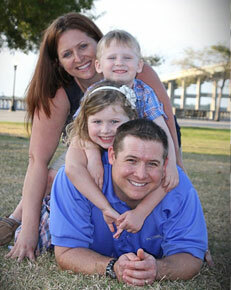 (Dr Billy) is a third generation Dentist and was born and raised in Fort Myers, FL. He studied at the University of South Florida and obtained this degree in Biomedical Sciences and minored in Biomedical Physics. Dr. Billy then attended the University of Florida College of Dentistry. There he received two prestigious awards for the study of Implants and an award for outstanding Oral Surgery Skills. Upon graduating from the University of Florida he returned to Fort Myers and started practicing with his father, Dr William H Truax II. Dr. Billy is married to his high school sweet heart Amber. They have two beautiful children Savannah and Hanson. The family enjoys the outdoors as much as possible. In the summer they are boating and fishing, and in the winter they can be found camping and hunting. Dr. Billy prides himself on providing the highest quality dentistry possible, and does that by performing the newest concepts in dentistry with a mix of time tested procedures and materials to get the best result possible for you. He also can confidently give you the best care possible since he constantly takes continuing education courses in all aspects of dentistry. Dr Billy has spent countless hours at the Dawson Academy studying and learning the newest concepts in complete dentistry so that your new filling, crown, or smile doesn’t just look great, it feels great. He has also taken many other courses around the country so that you have the best options and outcomes for whatever your needs are. Dr Billy’s office has over a fifty-year history in Fort Myers. Dr. Bob Anderson opened the practice in 1961. After a short dental career here, he felt the calling to be a missionary for the Downtown Riverside Baptist Church. So in 1976 he packed his bags and moved to Africa to provide dental care and Preach. After completing his tour in the Navy, Dr. Billy’s dad, Dr William Truax II, purchased the practice from Dr. Anderson in 1976. 32 years later Dr Billy, Dr William Truax III, joined the practice. And Finally in 2010 Dr Billy purchased the practice from his father.